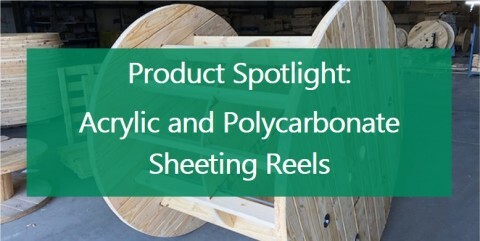 5 Features to Look for in a Plywood Reel | Anderson Forest Products, Inc.
At Anderson Forest Products our mission is to provide the highest quality product to our customers. We take into consideration all the specifications our customers need for their reels, and we are happy to manufacture both standard reels and unique reels with rare specifications. Below are five features in particular to examine when assessing the quality of a plywood reel. Each reel has at least two flanges, which are usually identical. The flange diameter can be as large as you need it to be. If the diameter is so large that we can’t cut it out of plywood, we can build it using lumber instead. Each flange has holes drilled in it for the bolts that hold the finished product together. The location of the bolt holes is customized for each product. By default, bolt holes will be evenly spaced on the flange unless you request different placement. We manufacture the fiberboard paper cores in-house for use in our reels. This means we have the ability to make cores of various diameters, thicknesses, and lengths according to customers’ needs. The glue we use in our paper cores makes them extremely durable and able to support the weight of cable. Instead of a paper core, it is possible to use wooden staves as the core of a plywood reel. This is typically only done if the core diameter is larger than 12” or if your unique product calls for it. 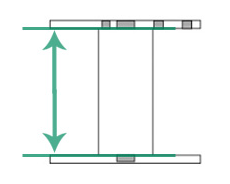 The length from the top flange to the bottom flange is called the traverse. We can make the core longer or shorter to accommodate the traverse length you need. Many customers prefer for their company logo to be painted on their flanges in our facility. 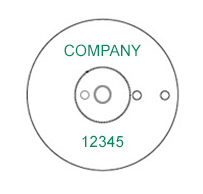 We can add your company logo and/or product number to any plywood flange. All we need is for you to provide the image(s) you want painted onto your flanges.